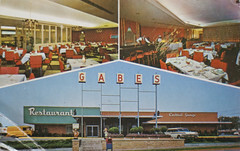 I grew up in Owensboro, Kentucky, and worshipped weekly at the Sunday buffet at Gabe's Restaurant. I can almost smell the fried chicken… I wish I could. The building was demolished. I'm not sure when — probably the late seventies, or the early eighties. On Sundays, the building was rather labyrinthine, and — if you had lassez-faire parents like we did — a great place for a couple of under-10-year-old boys to "explore," after having shaken the hand of Gabe Fiorella himself — always stationed at the threshold to the dining room — and been seated. A favorite was the lounge (upper right), which was closed on Sundays, due to local ordinance, I'm sure. But the room had no doors, so it was merely darkened, with an eerie glow coming from behind the bar, and the walls lined with heavy red velvet curtains that my brother and I could skulk around behind. These are some of my fondest memories: playing some concoction of "Man from U.N.C.L.E." and Hide-n-Seek at Gabe's. Downstairs were hallways with offices, a little musty from the common practice of indoor smoking in those days and just creepy enough to enthrall two brothers every week after church on Sunday. the granddaughter in full effect — as usual. K — more excitement please! I made this photo a few years ago, and saw the opportunity again — couldn't pass it up. From one of my grandmother's immaculate scrapbooks of their European travels. Here's the trailer for the latest — and I think most important — film by my dear friends and former Lexxers Eren McGinnis and Ari Palos, known collectively as Dos Vatos Productions. Kentucky seems worlds away (NOT, it turns out) from the headline-grabbing Arizona conflict that is the topic of their latest film, but it seems only a matter of time before Lexington — with its vital and under-documented Latino population — comes face-to-face with similar debates. This month, the film world premiered at the San Diego Latino Film Fest , followed by an Arizona premiere (photos) in Tucson — where the controversy continues to unfold as I write this. While working recently in Tucson — far from the Bluegrass — on graphic materials for the movie, I was fortunate enough to learn some of the details of a struggle that colors the days and lives of thousands of young Arizonans. I also got to see the charisma and grace of not just some of the "stars" of this film, but also a few of the many who fight on a daily basis for the rights of our country's largest minority population. Precious Knowledge will be moving through the festival circuit over the next several months. Their Facebook page is probably the best place for info on upcoming screenings. Until you can see it — and you should, I don't care what color your skin is — here's the trailer. Here's a video look at Day Two of HONK!TX, the amazing festival of community street bands that my own March Madness Marching Band (at the beginning, seen leading a neighborhood parade and then performing The White Stripes' Seven Nation Army) was lucky enough to be invited to play. Finally, at 5:50, Austin's Minor Mishap Marching Band — whom I consider to be kindred spirits (we're both MMMB!) — show their stuff. They were the festival hosts and partial organizers. Amazing job. Incredible fun. Inspiring beyond words. Thank you, Minor Mishap and HONK!TX organizers ILoveMikeLitt for an unforgettable experience! March Madness Marching Band performs our Helloween Suite at Honk!TX and I get killed by a shark. Again. Also: trombonist John Pope's original composition Fun is Good! Here it is, then! 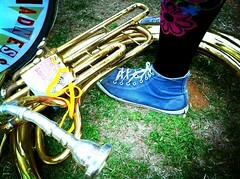 The photo set of the amazing adventures that March Madness Marching Band had at HONK!TX 2011! March 10, 2011 - Mick Jeffries tries a new position for playing his bass drum along with fellow members of the Lexington, Kentucky based March Madness Marching Band at Court Square Park. MMMB is a volunteer, community group launched in 2008, that bills itself as "a symphony of mismatched musical instruments; a kaleidoscope of band-inspired costumes; a choreographed gaggle of hoop dancers; an array of unconventional, unpredictable dancers and spinners." story from the Austin American-Statesman with photos! Thanks to YouTube's "PillowRancher" for getting some phone video of March Madness Marching Band's Saturday parade and afternoon performance! incredible! mesmerizing! scantily clad! carnivale!! LexKY's March Madness Marching Band lines up for Sundays Big Parade at @honktx. my breast swells with ecstatic pride. the wild rumpus! @honktx afterparty, surely 1 of the greatest parties EVAR! Members of the March Madness Marching Band from Lexington, Kentucky, perform at the East Side Drive-In Upper Tier during the Honk! TX Festival of Community Street Bands held on East Sixth Street in Austin, Texas on Friday March 11, 2011. Time to go to Honk! Tx! It's a dream come true for the March Madness Marching Band! Stay tuned for some mad photo-blogging over the next four days as a busload of craziness journeys from Lex KY to Austin TX and back!! snacks & wi-fi at 37,000 feet! thanks, Southwest! right now, 30,000 feet over New Mexico. I retain my bleeding edge. plenty of oranges! it's like they grow on TREES! I have a hard time going more than a few feet without taking more photos like this. Decor: A. Vibe: C-. Well, as long as this vintage joint still stands, I guess there's time to get rid of the sports-bar TV's and revise the happy hour to include — y'know — actual Tiki drinks. Sorry, cactus — it's Brie. a to-die-for Brie & Spinach panini from the deft sandwich hand of Eren. omg.